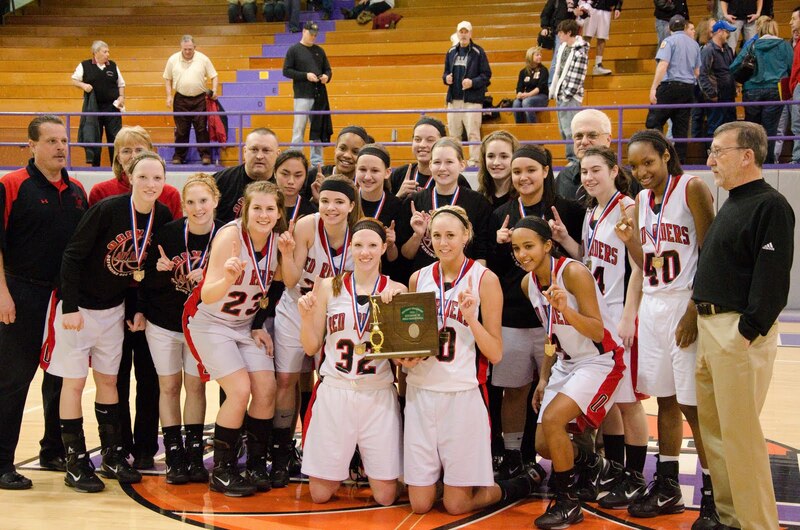 Orrville Red Rider Sports Blog: Lady Riders....District Champs!!! March 1st - "I think the Riders have what it takes to knock off the Smithies, and to win the entire district....but you know how it goes...you have to prove it on the court." February 9th - "I like this Lady Rider team, they've been tested and to me, have the talent and leadership to win those big games." January 27th - "I like the makeup of this team, they play tough and don't give in." I liked the words from Coach Alberts about being a TEAM, about playing hard, and about unselfish play. So what' next for this team? A date with Youngstown Ursuline this Wednesday at Cuyahoga Falls High School (map here) at 8pm. Elyria Catholic faces Gilmour Academy in the other regional semifinal. Notice a trend? Gilmous ACADEMY....Elyria CATHOLIC....Youngstown URSULINE. The regional is stacked with private schools. Gilmour Academy was the school the Riders volleyball team lost to in the regionals back in the fall...so maybe a little revenge factor is in play. Regardless, they'll be carrying the banner for public schools this week. Here's the entire regional bracket, and the statewide bracket showing all 16 teams left standing. Keep an eye on my facebook and twitter account for information on ticket sales. Good luck Lady Riders. Two wins from the Final 4. Great win today, and hope there's more magic to come. Three of the 4 teams were at the volleyball regional with Ursuline the only one not there.